Garage workshops can get pretty uncomfortable without the right heating and cooling setup. The best method of heating and cooling a garage workshop is by installing garage attic insulation, garage door insulation, and a garage mini-split heating and cooling unit. This is also the most effective way to heat and cool a garage workshop according to our experience. Especially when you want your garage to hold the right temperature for long periods of time. Looking for garage workshop heating and cooling services? We can help with that too! Our service area includes Arizona, Texas, and Florida. 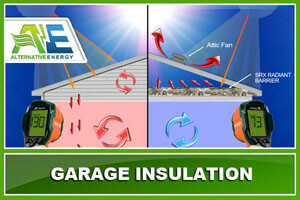 Garage Radiant Barrier keeps the heat out of your garage’s attic. Radiant barrier help regulate the temperature in your garage. Garage radiant barrier blocks radiant heat out during the summer and keeps the heat in during the winter. Installing garage radiant barrier will cost you $500 for single car garage and about $800 for a double car garage. In general, it costs about $2 per sq ft to install garage radiant barrier. We developed a product called SRX (SuperReflex) that regulated the temperature inside garages and homes during the summer and winter. When installed in your home, SRX can save you 50% on your electricity bill guaranteed! SRX is the best radiant barrier on the planet! Garage door insulation is actually the most important step for heating and cooling a garage workshop. The garage door is where most of the air temperature is gained or lost. Your garage door will let hot air in during the summer and warm air out during the winter. The only way to avoid this is by installing garage door insulation. Garage door insulation will seal up your garage workshop so cooling methods will work more effectively. However, there really isn’t any reason you should be insulating your garage unless you plan on installing some type of cooling/heating mechanism. We use the same SRX insulation for the garage door as well. It helps to seal up any remaining gaps for full temperature control. SRX is rated as the best insulation for garage doors and will make heating and cooling a garage workspace much easier. This ensures that you will be working in a more comfortable garage even without installing a garage ac unit. Installing a ductless air conditioner in your garage is the most recommended method for heating and cooling a garage workshop. 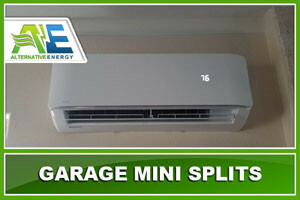 Most garage mini splits also work for heating as well so you will have more control over the temperature inside your garage than ever before. Although, as we mentioned in the above paragraphs, only installing a garage mini split isn’t effective enough to cool your garage workshop alone, and wastes a lot of energy. You need to install a radiant barrier in the garage attic and insulate garage door to make your mini-split system work more effectively. Plus, the temperature will stay regulated longer and save you more money on heating and cooling bills. Installing a ductless air conditioner for your garage can cost anywhere from $2500 for a single car garage, $3,000 for a double car garage, all the up to $4,000 for the some of the really nicer units. A high powered garage attic fan is a great final step to keep your garage workshop and comfortable as possible. The will ensure that all of the hot air is pushed out of your attic before making it inside your garage. This will keep the heat out of the attic, the garage door insulation will keep the rest of the heat out, and your garage mini-split system will run like a champion. This will give you complete control over your garage workshop temperature. It costs about $250 for professional garage attic fan installation. However, not everyone will need a garage attic fan. Total for heating and cooling a garage workshop services is about $3348 for a single car garage and $4370 for a double car garage, including taxes and installation fees. In the video below, Aaron explains the best 3 ways for heating and cooling a garage workshop. Need Professional Services For Heating & Cooling A Garage Workshop? 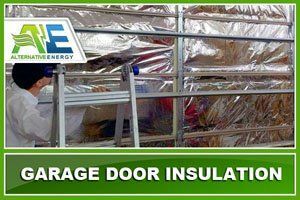 Alternative Energy, LLC can help with garage insulation, garage door insulation and garage mini split system installations in Arizona, Florida & Texas. Arizona including: Phoenix, Mesa, Paradise Valley, Tempe, Gilbert, Cave Creek, Chandler, Surprise, Peoria, Glendale, Scottsdale and entire Metropolitan area. Florida including: Broward County, Fort Lauderdale, Pembroke Pines, Hollywood, Miramar, Coral Springs, Pompano Beach, Plantation and Sunrise, Florida. Florida including: Miami Dade County, Miami, Hialeah City, Miami Beach, Homestead, North Miami, Coral Gables, Doral City, North Miami Beach and Cutler Bay, Florida.